Newark, Calif., June 27, 2016 — For the second time running, RoseRyan, a leading accounting and finance firm that delivers specialized consulting services, has been awarded a Top 100 Workplaces honor by the Bay Area News Group. 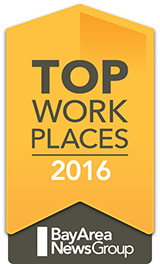 The Top Workplaces™ lists are based solely on the results of employee feedback. Several aspects of workplace culture were measured, including alignment, execution and connection. RoseRyan ranked 36th in the Small Companies category, achieving outstanding results for its overall organizational health. Conducted by WorkplaceDynamics, the confidential employee survey behind the Top 100 Workplaces list assesses employees’ opinions about their jobs and their employer’s long-term outlook. RoseRyan’s results were particularly high in execution this year. The firm’s workforce believes strongly that the leadership understands what is really happening and that the firm does things efficiently and well. The survey also indicated that new ideas are encouraged at RoseRyan and that the workplace benefits from its collaborative atmosphere. The list appeared yesterday in a Bay Area News Group supplement, appearing in media outlets around the region including the San Jose Mercury News. RoseRyan is hiring seasoned accounting and finance professionals across the board for engagements throughout the Bay Area. Learn more about our part- and full-time positions here: www.roseryan.com/land-your-dream-job. Headquartered in Exton, Pa., WorkplaceDynamics specializes in employee feedback surveys and workplace improvement. This year alone, more than 2 million employees in over 6,000 organizations will participate in the Top Workplaces campaign—a program it conducts in partnership with more than 40 prestigious media partners across the United States. RoseRyan is a leading accounting and finance consulting firm serving fast-moving companies in the San Francisco Bay Area and beyond. Founded in 1993, our senior level pros guide companies through finance challenges at any stage and have particularly deep expertise in the technology, life sciences and clean tech sectors. We tame the tricky transactions, optimize processes and conquer the complex for companies of all sizes, from the startup to the mature, public enterprise. Depend on our award-winning team to navigate beyond the numbers so you can stay on track. Learn more at www.roseryan.com.